This kit includes the entire Interweave Knits Holiday Gifts 2013 special issue and three skeins of yarn to make the cover knitted cowl project in Larch, a gold hue. Perfect for the upcoming gift-giving season, this exclusive Kit pairs the new Interweave Knits Holiday Gifts special issue with three skeins of Tundra yarn, enough to make the cover knitted cowl project. Hurry, we have limited quantities of kits, so order today for the best selection! 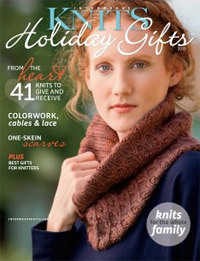 This 144-page special issue features 41 knits to give and receive. Celebrate cable and lace colorwork, one-skein scarves, knits for the whole family, and gift ideas for knitters. Plus, visit with designer Kyoko Nakayoshi, embrace the spirit of giving with knitting for charity ideas, and created knitted optical illusions with stripes. Featured on the cover of this special issue is the Leadville Knitted Cowl, designed by Annie Watts. This double-thick cowl with lattice patterning on one side and ribbing on the other is knit in the round then folded and seamed to create the generous double-layers. 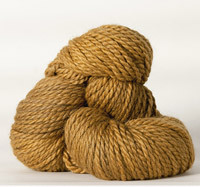 This 60% baby alpaca, 30% merino wool, and 10% silk blend is an absolutely beautiful 2-ply bulky weight yarn. With a soft touch, bounce, shine, and drape, this yarn is both warm and comfortable to knit with and wear. Each skein consists of 120 yards/100 grams of yarn. This kit includes 3 skeins in Larch, a unique mustard, gold hue. Note: colors may vary slightly from what is seen here. Knit this unisex cowl for a quick gift this upcoming holiday or add one to your own wardrobe this winter. This classic design offers a cozy, stylish accessory made with quality materials. Plus, enjoy the other 40 knitting patterns offered in the new Interweave Knits Holiday Gifts 2013 special issue for more gift-giving inspiration. Hurry, we have a limited supply of Larch Leadville Knitted Cowl Kits.